The Piper PA-25 was originally developed by Fred Weick as the AG-3. The prototype was flown first in 1957. The AG-3 and thus the Piper PA-25 was evolved from the Texas A&M College Aircraft Research Center AG-1 Agricultural plane. Fred Weick designed the AG-1 at Texas A&M in 1950. In the design of the AG-1 crop-duster safety recommendations were incorporated, done by Hugh DeHaven and Howard Hasbrook. Deliveries of the Piper PA-25 Pawnee started in August 1959 with the PA-25-150, powered by a 150 hp Lycoming O-320 engine. Deliveries of the more powerful PA-25-235 with a 235 hp Lycoming O-540-B2B5 six-cylinder air-cooled engine began in 1962. Production of the Piper PA-25 ceased in 1982, with 5015 built. The 1962-built Piper PA-25-235 Pawnee s/n 25-2264 (frame 25-2205) was registered first N6694Z in the USA. On 20 August 1963, the aircraft was registered G-ASLJ in the UK with Ripper Robots Ltd. On 17 September 1963, registration G-ASLJ was cancelled as exported to Sudan. In Sudan, the aircraft was operated as ST-ACH and ST-ADS. On 18 February 1969, the Piper PA-25-235 Pawnee was restored to the UK registerer as G-ASLJ with Crop Culture (Aerial) Ltd. On 10 March 1969, the G-ASLJ was registered with Aeronautical Services West Africa Ltd. On 24 November 1969, registration G-ASLJ was cancelled as exported to Holland. On 5 March 1970, Piper PA-25-235 Pawnee was registered PH-VBC in the Netherlands with with K.A. van Beek. On 29 November 1976, the registered name was changed to K.A. van Beek's Luchtvaartbedrijf BV. On 2 June 1982, the registered aircraft type was changed into a Piper PA-25-260 Pawnee. 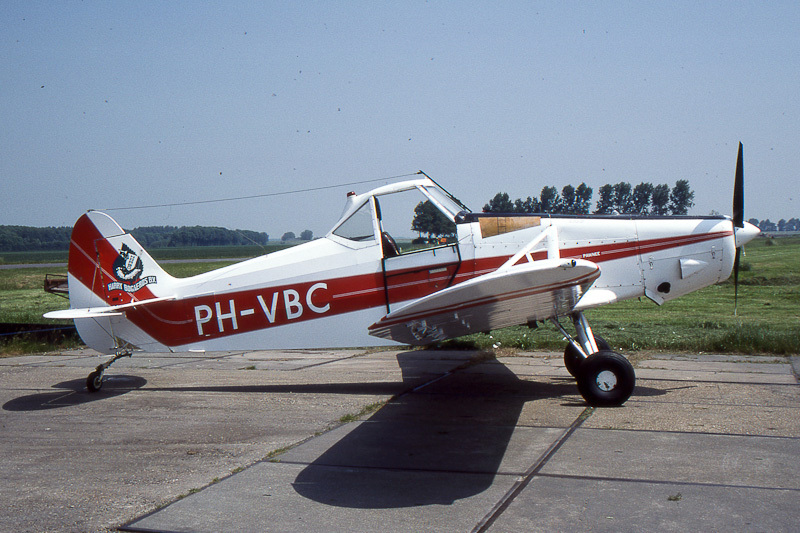 On 27 November 1985, the PH-VBC was registered with Vliegtuigbeheer Zeeland BV. On 25 Juuly 1988, the PH-VBC was registered with Harry Bogaerds BV. On 14 March 1994, the registered name was changed to J.A.P. Bogaerds Beheer BV. On 21 May 1996, the Pawnee was registrered with A.R. Tjon Tjauw Liem. After the CofA of the Piper PA-25-260 Pawnee expired on 19 April 2005, registration PH-VBC was cancelled on 23 July 2006. Piper PH-VBC was seen in the colours of Harry Bogaerds BV at Midden-Zeeland airfield near Middelburg in the Netherlands. On 12 August 2016, the former PH-VBC was given as to be registered in Brazil as a Lavia PA-25-260.